The CM2396 Radio/Cassette Player (and similar models such as CM2294 and CM2296) was factory fitted to Mercedes cars during the mid to late nineties. Some owners like to retain the original models. A code-locked unit can usually be decoded based on the serial number of the set. The serial number can be found on the chassis of the radio and will look similar to AL2396V1149369 (starts with 'AL' and the model number of the unit, 14 digits in total). So the first thing is to pull the radio from the dashboard enough to be able to read the label. 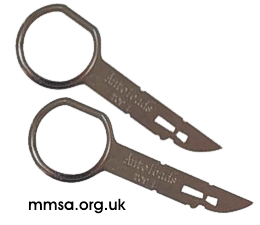 You will need a pair of car radio removal keys. 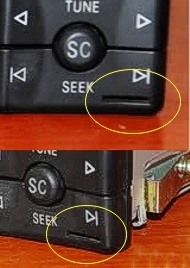 These 'flat keys' (as below - make sure you buy the right ones - these are flat, not twin round prongs) are inserted into the horizontal cut-outs low down on either side of the front panel (see the photos to the left, showing the position of one of the key release holes - not always easy to see if you don't know where to look!). When inserted as far as they seem to go, the keys will push the internal spring clips back against the chassis, allowing you to draw the radio out. If the clips inside have released, it should slide free without much effort. After we have sent you your unlock code, switch the radio on - it should show CODE on the display with the 'C' of CODE flashing to show it is ready to take the code. After entering the last number of the code, check it is correct and then press and hold the 'SC' button (lower right on the front panel) to accept the code. Many models of radio have an automatic 'temporary lock' feature that will lock out any further code entry attempts if too many are attempted. The screen will often display 'WAIT'. For this reason, do not try to guess the code, and enter the code we send you carefully. Most radios will exit the temporary lock state after an hour or so of leaving the radio powered on, sometimes up to 2 hours. In some cases, further unsuccessful attempts will cause the radio to permanently lock, and in those cases only a physical reset of the code (on a service workbench) will get it going again.